materfamilias writes: Wendy's Garden: Addendum from Above. . .
Wendy's Garden: Addendum from Above. . . I'm delighted that so many of you are enjoying this first post in what I hope might be a series of peeks into various gardens. With various family happenings at the moment, I'm not only very grateful to Wendy for offering up her garden for our viewing, but also for her generosity in responding to reader comments (rest assured that I'm following the conversation from behind the curtain, though, and enjoying the engagement). 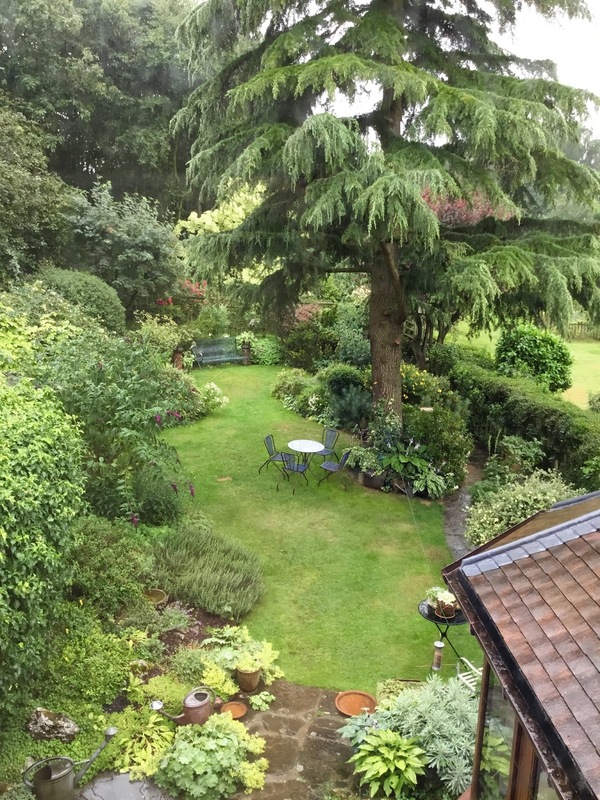 And when Ceri in Bristol wondered if we might be able to get an overhead view of the garden, so as to better comprehend the whole, Wendy pops a photo in an e-mail to me -- thank you! So here's that overhead view, and I'll also go back and add it to the original post. . . I read this post before the previous one, so I'll comment here. What a lovely series (?, with hope) you are beginning. Gardens continually evolve as people change, move, and adapt to life as it is. Wendy's garden is wonderful! Thanks Lorrie . You are right , gardens don't stay the same for long . Mine seems different every month even . Perhaps that is part of their appeal . How kind of you, Wendy and Frances. The bird on the roof's eye view makes the transformation even more extraordinary. Thank you for sharing it. And yes, I too am enjoying the first of what I hope will be an ongoing series of peeks into other friends' gardens. This is just wonderful...I have gone back and forth between photos to look at the changes especially the trees. Wendy, does the property seem bigger to you now, the way a room does when it is furnished versus empty? Thanks Georgia . I think the area seems smaller really, than it did when we arrived but I don't like to see all a garden at once . It's nice to have little areas reveal themselves as you go along - Hidden corners . Your garden shows such a respect for the natural world--a beautiful balance between wild and cultivated, a resting place for the soul. Thank you Elle , perhaps deep down it is what we gardeners aim for . A resting place for the soul .